The quickest and easiest step to supporting renewable energy is to switch to ethical power use. The quickest and easiest way to support renewable energy is to switch to an ethical electricity provider. Use the table to compare electricity providers. Choose an ethical provider (stars in bottom rows) and contact them to make the switch. It's that simple. ​Switching to ethical electricity is a powerful way to significantly reduce your carbon footprint because around 50% of NSW's carbon emissions come from producing our power. Understanding which retailers support community and renewables over coal and gas is key. Let’s support a power company that invests in our clean energy future. COREM (Community-Owned Renewable Energy Mullumbimby) highly values and recommends Enova Energy. A local, not for profit, community-owned enterprise which invests in local renewable energy generation and energy efficiency projects. Enova aims to supply our region with locally made renewable electricity. 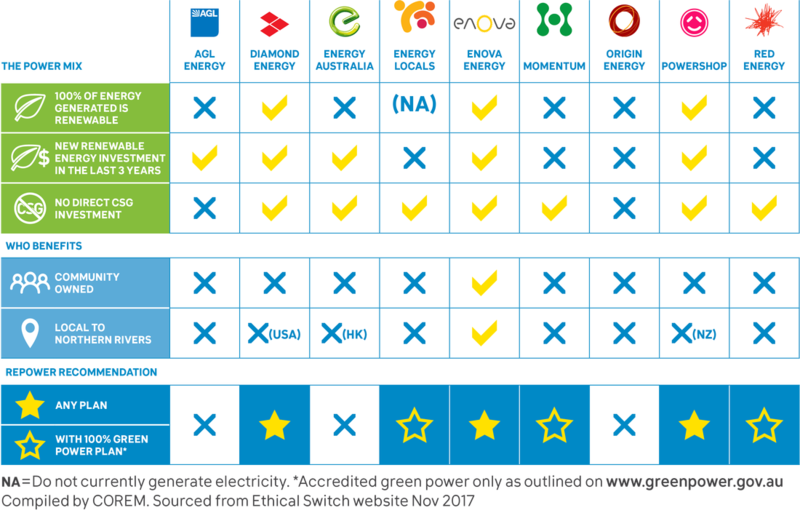 Enova offer a range of plans to suit your budget or environmental intentions and pay a very high feed in tariff for your solar power, see enovaenergy.com.au. If you decide to sign up online use the promo code COREM25 to receive $25 off your first bill and they also will give a donation to COREM. Repower Byron Shire uses the following criteria to determine ‘ethical’ power. Participation in new renewable energy projects and technologies such as solar gardens, peer to peer trading, micro-grids etc. Support a clean energy future – e.g. the renewable energy target and Paris Climate agreement etc. Another way to ensure your electricity is not contributing to climate change is to buy Government accredited “GreenPower” from your existing retailer. Purchasing GreenPower allows you to support Australia’s renewable energy sector by matching your electricity usage with GreenPower accredited renewable energy certificates. Usually this is a surcharge to an existing plan. An estimate of the cost of GreenPower is around 5-8 cents per kWh more than your current electricity rate, so for low electricity users this may be only a few dollars a week. By committing to the Repower Byron Shire campaign, we can have locally made renewable energy that ensures our air and water is clean and healthy for our families now and in the future. If you are a tenant but still want solar? CORENA have offered 3 special offers to provide for a no-interest loan for 6 years to tenants and landlords who want to install solar. The costs and incentives are split 50/50 between tenant and landlord. If you are interested in taking advantage of this unique offer please email me.